Family trips to the beautiful countries of Scandinavia are a hot ticket these days. The incredible vistas, easy walking cities, and fluent English locals all add to what make Denmark, Sweden and Norway some of the most coveted European places to visit. This summer, I took my children on a tour of Norway to show them a part of beautiful northern Europe and trace our family history. 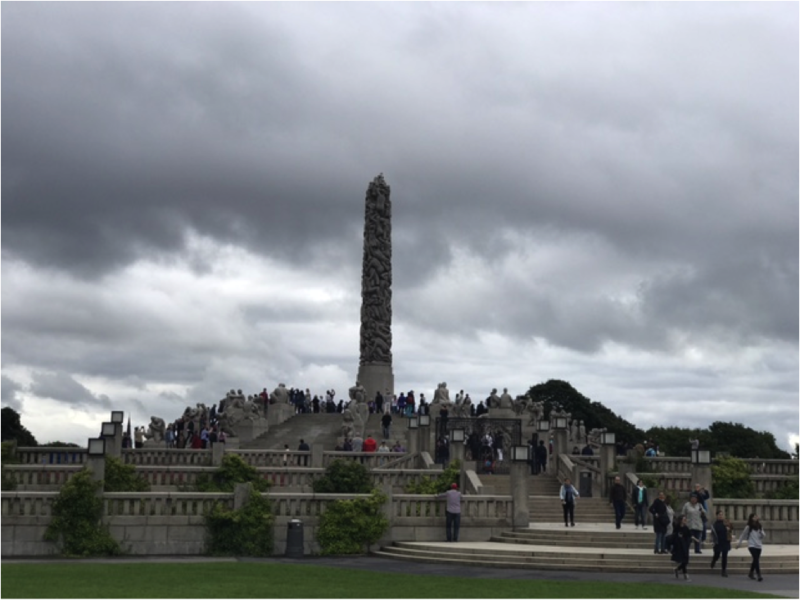 At the same time, Melissa Lee, my friend and a travel advisor at Royal Travel and Tours took her kids to the capitals of Sweden and Denmark. Here we share our adventures. First off, we were both fortunate enough to snag amazing kids airfares on SAS that flew nonstop from Chicago to Copenhagen. The Airbus planes were new and well appointed with three separate and comfortable cabin options: economy, SAS plus, and business. Oslo is the smallest of the three Scandinavian capitols but its intimate size only enhances its charm and makes it such an easy walking city when traveling with young children. Book at room at the centrally located, and Signature preferred, Hotel Continental, which is just a block away from the Palace and close to the waterfront as well as the best shopping and restaurants. For the adrenaline junky, a summertime visit to Oslo must include a zipline ride at Holmenkollen ski jump, site of the 1952 Olympic winter games and several world championships. From the top of this landmark you can enjoy the best views in Oslo then descend 1,185 feet with the same speed and sensation as the ski jumpers. Next stop is the Viking Ship Museum where you can see the world’s oldest best-preserved Viking Ships as well as treasures and household items found in Viking tombs buried around the Oslo Fjord centuries ago. One can easily explore Oslo on foot to see some of its national treasures. For example, the Norwegian National Opera and Ballet, which opened in 2008 and is designed to look like a great iceberg coming out of the Sea, is an architectural gem and fun to walk across. A visit to the National Museum is easy for young children, due to its smaller size, who can see works from the great Norwegian artist Edvard Munch as well as other impressionists such as Cezanne and Gaugin. A fun family activity is to stop by the Palace at 1:30 pm any day of the week to witness the changing of the guards. Kids will love that there are no gates out front and you can walk right up to the front of the Palace. A beautiful garden is set behind and is a lovely place to stroll or have a picnic. You cannot spend time in Oslo without wandering through Vigeland Sculpture Park, one of Norway’s most popular tourist attractions and the world’s largest sculpture park made by a single artist. For young children who need a break from sight seeing there is also an incredible playground within this park. Hotel d’Angleterre is a luxurious oasis next to Copenhagen’s most fashionable streets and within walking distance to many must-see attractions, quality shopping and the best Danish dining experiences. The hotel’s pool and Michelin-starred, family-friendly restaurant, mean the whole family can enjoy the amenities and offerings of the hotel. Copenhagen is home to the world’s second oldest amusement park in the world, Tivoli Gardens, which opened its doors in 1873. The park today is home to thrilling rollercoasters, a wide range of restaurants offering fast-food to high-end dining, outdoor concerts from world-class performers, theatre and dance performances and beautifully landscaped gardens. We spent a morning here checking out all of the rollercoaster and had lunch at a beautiful sit-down restaurant where the adults had wine and fresh shrimp open-faced sandwiches. For another perspective of Copenhagen, we boarded a canal cruise to see the colorful sights of the old waterfront shipping district of Nyhavn and were wowed by all the modern design and architecture of the The National Gallery and Opera House, the Christiansborg Palace and the iconic Little Mermaid statue based on the popular Hans Christian Andersen fairytale. The Grand Hotel in Stockholm was the elegant and historical waterfront hotel to begin our grand tour of the Scandinavian capitals. Its location in the city center between the Royal Palace and Old Town meant we could walk to many of the sites and were never far from the user-friendly public transportation. Stockholm is a city made up of 14 island in the Baltic Sea archipelago. A short ferry ride from Old Town is the island of Djurgården, a veritable wonderland full of museums and entertainment from Viking history and modern art to an ABBA experience and rollercoasters. Stockholm’s art and design museum featuring the most influential Scandinavian artists and Skansen, an open-air musem showcasing Swedish culture, tradition and homelife of past days. And of course, a visit to Stockholm would not be complete without checking out the new The ABBA Museum where visitors can not only see famous memorabilia and learn about the group, but also have the unique opportunity to become the 5th band member through their interactive studio experience.